Writer/director David Lowery’s art house take on Beetlejuice is a haunting (in every sense) meditation on the nature of existence, the way we deal with the passing of time, and features Oscar winning Best Actor Casey Affleck spending most of the film under a white sheet. 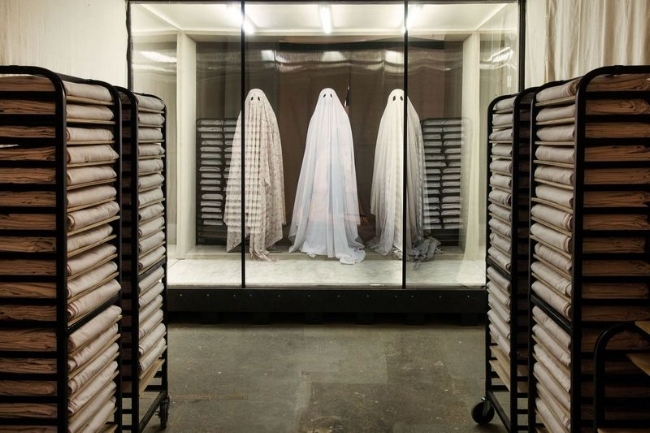 The white sheeted ghost is one of the oldest visual clichés, and, with the exception of Michael Myers’ spectacled variation in Carpenter’s Halloween, is usually utilised for comedic effect. Not so here. Lowery frames the white shrouded figure with cut out eye sockets in such a way as to totally bypass the giggles and instead evokes the mournful and solitary experience of a soul out of time. This is achieved by meticulous framing and judiciously sparing camera movement within the boxed 1.33.1 aspect ratio, and the carefully choreographed gestures of Affleck beneath the shroud. Dialogue is mostly kept to minimal interactions, with the sole exception being a party guest pontificating on the nature of the cosmos and thereby acting as the director’s mouthpiece for his own existential fears. (Was it absolutely necessary to literally spell it out in this way – it’s arguable – but it is visually counterbalanced by the intently listening unseen unspoken observer in the room). 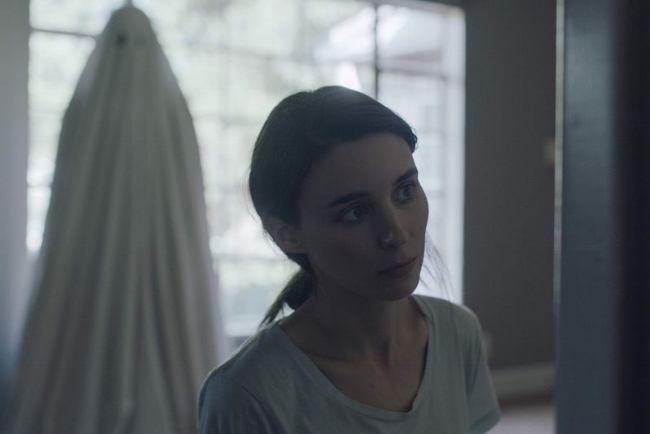 Rooney Mara brings a delicate nuance to her portrayal of ‘M’ in the film’s first act, conveying grief without words, and provides an emotionally raw and honest depiction of comfort eating in an extraordinary extended sequence where she gradually progresses from tentative jabs to whole scale devouring of a sizeable homemade pie! Long, measured (often) wordless scenes leave a broad soundstage for composer Daniel Hart to convey the ethereal atmospherics and narrative time-shifting progression of the film which he does so beautifully. 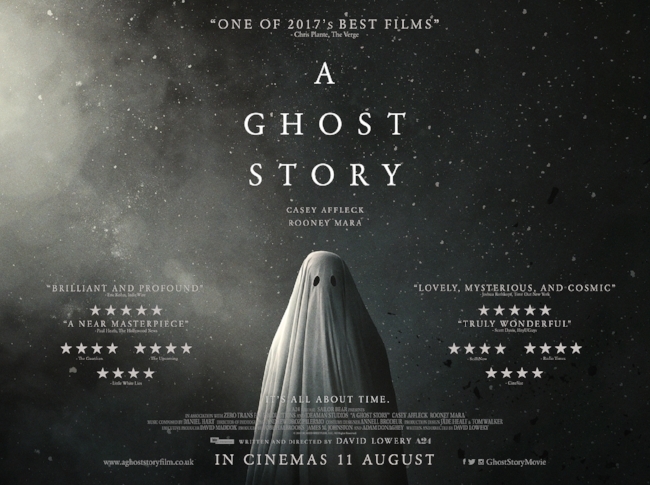 This is a film about time that takes its time to convey the natural rhythm of day-to-day life, but equally, fast-forwards through its time travelling passages with a visual ebb and flow that suggests the passive nature of its white sheeted protagonist as he ‘ghosts’ through time. It’s a beautifully simple concept executed with a delicate and poetic hand, and I found the film both uplifting and yet at the same time profoundly sad. Not bad for a bloke under a sheet. Review first published on Fleapits and Picture Palaces.